For this lab, I wanted to test how much power our little DC motors have. Since it’s acknowledged that they don’t have much torque, I didn’t want to choose something too heavy, but I did want to extend the range of the spinning motion so that it would be visible from far away. 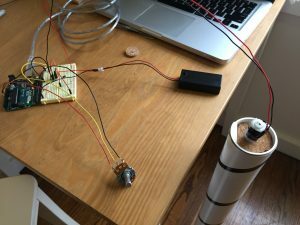 Looking around my apartment, I happened to have a poster tube sitting around, which I realized would make the perfect object: it’s long but slender, doesn’t weigh much but it stable, and is round, so I could fairly easily spin it with the motor without getting too much vibration. But after that, I wanted to try out using the FSR so that I could control the spin while holding the motor, so that I’d have I/O coincidence. That’s what I’ll be demonstrating in class. One interesting observation I had was that with a heavy-ish weight, the motor takes quite a bit of “revving” to get to a level of power sufficient to overcome the inertia. And then, after removing power, my barber pole keeps spinning for quite some time. Interesting to watch it in action.